In the “Achterhoek” and also in the region “Twente” in the eastern part of The Netherlands it was the most ordinary matter in the world. The eldest son, because it generally is he who continues the farming business of his parents, gets more than his brothers or sisters at the partitioning of the parental property. The other siblings must be content with considerably less than an equally proportional share. And they accept that arrangement naturally, because the family agrees completely that the successor can best continue the existence of the agricultural business as a whole. There is even a nice Dutch term for this: the “blijversrecht” or “right to stay” (literally, “the stayer’s right”). However, the eldest son does not get this bonus for free. In exchange for the over-allocation of property, the successor son must look after the parents until their death. Moreover, frequently he is obligated to provide unmarried brothers and sisters a “hoeskommen” or “homecoming place” until they are about thirty years of age. Sometimes he even has to provide them a trousseau when they get married. This remarkable tradition in local culture is so typical for the Achterhoek region that many people are not aware that it is actually contrary to Dutch law. Not that the Achterhoek people care much about that! In their opinion regular Dutch law is much too businesslike and offers insufficient guarantees for the continued existence of the parental farm. According to some research workers “the right to stay” tradition is an elaboration of a centuries-old Achterhoek practice, which was once dictated to the many serfs by feudal law, but now is cherished as a philosophy of life. The agreements concerning parental fortune and future parental inheritance were generally put on paper, signed by the parents, and were often also endorsed by the brothers and sisters. Not only was the concept illegal, but the agreements were formalized as well! Even though the document was authenticated in the Achterhoek by an official notary, this endorsement and the agreement terms, which were described in a “pre-contract”, “moral agreement”, or a “family agreement”, are contrary to the Dutch law. Such an agreement is, in principle, even null and void! In any event, this Achterhoek common law tradition, the wish of farmer families to keep the parental farmstead intact in the hands of the family, did enable many farmsteads to survive. Elements of this “right to stay” concept we can find in the memorabilia of the family Te Selle. A family contract was executed on the 20th of March 1855, following the occasion of the marriage on the 15th of March 1855 of Derk Willem te Selle (1827-1904) and Janna Berendiena Weerkamp (1822-1877) . Father Jan Albert te Selle (1800-1845) had already died at an age of 45 years while the family was still living at the farm “De Selle”. In 1855, ten years after his death his widow Dela ten Damme (1802-1883) signs the family contract to sell the movables of the farm to their oldest son Derk and daughter-in-law Janna. They will continue the farming. The amount is not stated in the contract, but it is clear that there is no more future on “De Selle” for the other brothers. Even though mother Dela still has the movables under her control for ten more years, afterwards she has to hand over everything to the oldest son Derk and his wife. 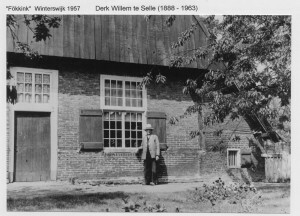 Uncle Jan Hendrik te Selle (1810-1888), living at farmstead “Meekes” in the Winterswijk hamlet Brinkheurne, signs his name also to the contract as a witness. Even if the six other sons did receive some money, the amount would not have been large. In 1861, six years after the marriage, the family had to move to farm “Fökkink”. Four years later in 1865 the complete movables were handed to Derk Willem and his wife and the purchase price must have been paid. Perhaps then mother Dela had sufficient money to give some initial capital to her sons Jan Hendrik, Harmen Jan and later Gerrit Jan for their emigration to America.